Bring a pan of water to a boil, and cook the potatoes until soft (about 20 minutes). Take the potatoes out of the pan with a slotted spoon and transfer to a bowl. Add the spinach to the hot water and cook according to package instructions. Drain, saving 1 cup of cooking water. Transfer to a blender, and process until creamy. Mash the potatoes with a ricer or masher, add the creamed spinach, 2 tablespoons olive oil, and season with salt and pepper. If needed, add some of the saved cooking water until you get the creamy consistency you desire. While the potatoes are cooking, cut 4 sheets of foil, of about 7x7 inches. Place 2 onion slices on each foil sheet, covered with 2 lemon slices and some chopped garlic. Cover this with a fish filet. Spread the fish with some ají amarillo paste, and season with salt, pepper, and some lemon juice. Fold the foil, wrapping the fish like a small package. Repeat with the rest of the fish and foil. Place the fish in a baking dish, and cook for 10 minutes, or until each foil package is filled with steam and looks inflated. Turn the oven off, take the fish out, and put one package on each plate. Serve the fish sprinkled with capers and chopped parsley, some pieces of cherry tomatoes, and a lemon slice. Serve the spinach mashed potatoes on the side. You can sauté the spinach with some garlic and onion if you prefer, and serve the fish over a bed of spinach, with regular mashed potatoes on the side. Instead of adding capers, lemon, and ají amarillo to the fish, you can vary this dish by covering each fillet with a little coconut milk and a few slices of fresh chile (Habanero or Thai, for example). 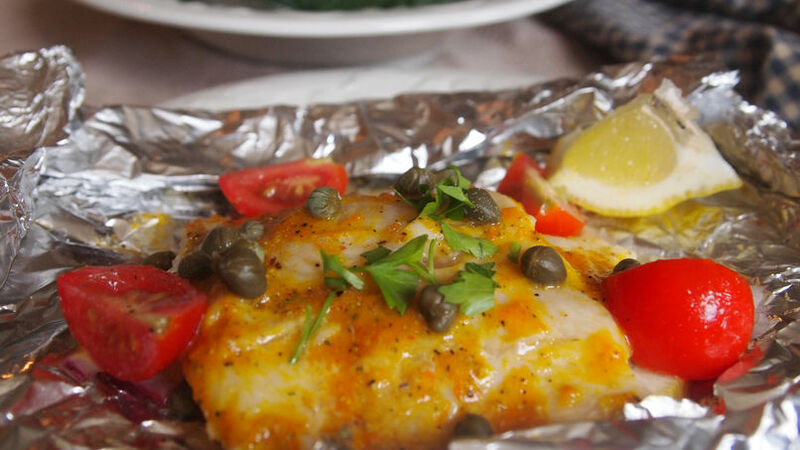 Every time I try a fresh, tender, melt-in-your-mouth fish recipe cooked in foil, I think the same thing: why don't I eat this more often? All you need to do is add a few spices, seasonings and herbs, and serve this dish with something simple like some wholesome spinach mashed potatoes!